Great photo here of Besserat de Bellefon winemaker Cedric Thiebault, in his cellar. We wanted to offer a little toast of Champagne for the pending weekend. Initially founded in 1843 by Edmond Besserat, Besserat De Bellefon is one of the great historic sites in Champagne. In 1927, Edmond Besserat, a grandson of the founder, married Yvonne de Meric de Bellefon, who came from another prestigious Champagne family, and the house of Besserat de Bellefon Champagne was created. Located in Épernay, Besserat de Bellefon is currently part of the Lanson-BCC Group’s portfolio of Champagnes and produces about 40,000 cases of the Cuvée des Moines range. I think that it is generally challenging to find great value Champagnes and the new releases by Bellefon fit that mold. 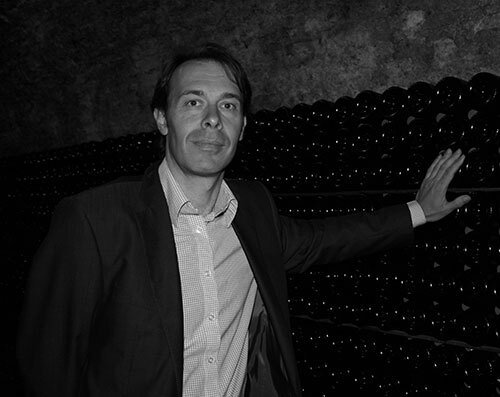 The house relies on the winemaking talents of Cédric Thiébault, who joined Besserat de Bellefon in 1999 and spent seven years learning Besserat’s style of Champagne before becoming winemaker in 2006. What is particularly unique about these Champagnes is that they are produced at only 4.5 atmospheres of pressure across the range rather than the standard 6. They are lithe, light on their feet and are great for pairing with food. Learn more about these great Champagnes at http://besseratdebellefon.com/en Here are the awesome new Champagne releases by Besserat De Bellefon.